Anglican church records provide the first written record so far found of a black presence in Lancashire. This entry in the register of St Mary’s parish church, Lancaster, relates to the baptism of “Richard Nigroe filii [son of] Peter a Blacamore”. It took place on 1 November 1602. Black-a-Moor was a term then in use to describe black people of African origin. During the 18th Century the black presence in Britain greatly increased. 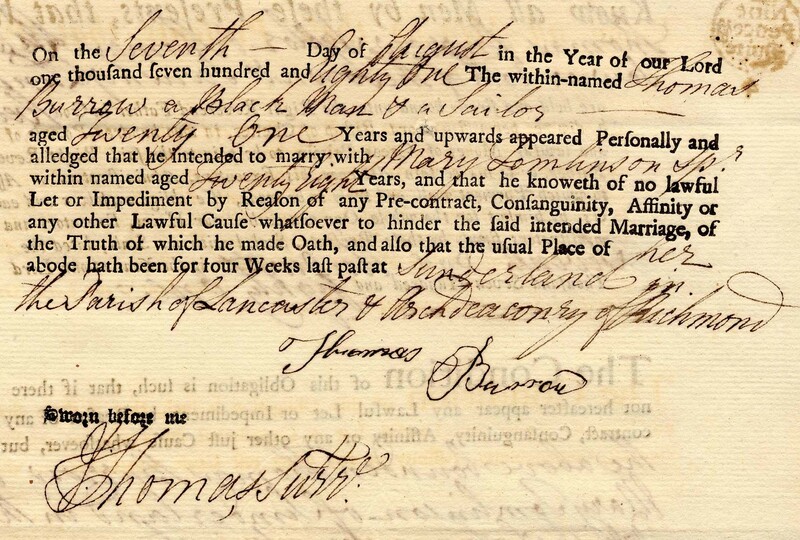 The marriage bond of Thomas Burrow, “a Black Man & a Sailor”, shows that he intended to marry Mary Tomlinson of Sunderland, near Lancaster, in 1781. Thomas signed his own name, unusual at a time when reading and writing were not generally taught to the working classes.